Let me start this by confessing that I am in no way a baker. I dread the thought of having to accurately measure quantities, sit by the oven until the skewer comes out clean and pace the kitchen nervously wondering if it that flour was self-raising or plain. So when my hubbies birthday rolled around I knew that along with it came the birthday cake. With the infrequency of my baking I decided to go hell for leather and make a version of Good Taste Magazine’s Amazing Maltesers Cake. Cue sweaty palms and heart palpitations. Now as much as I love Maltesers and the malt flavour I knew there was no way we would use enough malt powder to warrant buying an entire jar. Coffee on the other hand is a completely different story, as was the prospect of including delicious coffee cream as the layer filling. I also couldn’t bring myself to include the three layers of cream in the cake, though I am sure my arteries would have found it delicious so I opted for a mere one layer of heaven. Although, if you feel like adding the full three layers I am sure the cake would be polished off in one sitting. Without further ado the recipe for the best cake I have ever made, or had for that matter is below. This comment was seconded by my hubby, although I guess he kind of had too, and by the ladies at work who are avid cake bakers and eaters with the recipe requested and made on the same day – so hey, I must have done something right. 1 tbs instant coffee granules – add more or less depending on how strong you would like your coffee. I am not a regular drinker or fan of instant coffee, however I have recently found Maccona Gourmet Range – Indulgence which I don’t mind. Preheat oven to 160°C. Grease a 20cm round cake pan with butter and line base and side with baking paper. I did’t use a 20cm cake pan so you will notice mine isn’t as tall as the Good Taste cake, however this wasn’t a problem as I didn’t need to cut it into four layers. Place the brown sugar, milk and butter in a microwave-safe bowl. Cook in microwave on high, stirring every minute, for 3-5 minutes or until the butter melts and the mixture is smooth. Place the boiling water, coffee granules and cocoa powder in a bowl and mix until smooth. Pour in the cream and icing sugar. Use an electric beater to beat the mixture until fluffy. Set the ganache aside for 1 hour 30 minutes or until thick, glossy and spreadable. Meanwhile, use a large serrated knife to cut the cake horizontally into layers. Place the cake base on a platter. Spread the layers with the cream. Cover and place in the fridge for 1 hour 30 minutes to chill. Spread the ganache evenly over the top and side of the cake. Decorate with Maltesers. To get even rows when decorating, first make a strip of Maltesers straight down the centre of the cake, then add in rows on either side. Thank you it was pretty delicious! Thank you Sam! 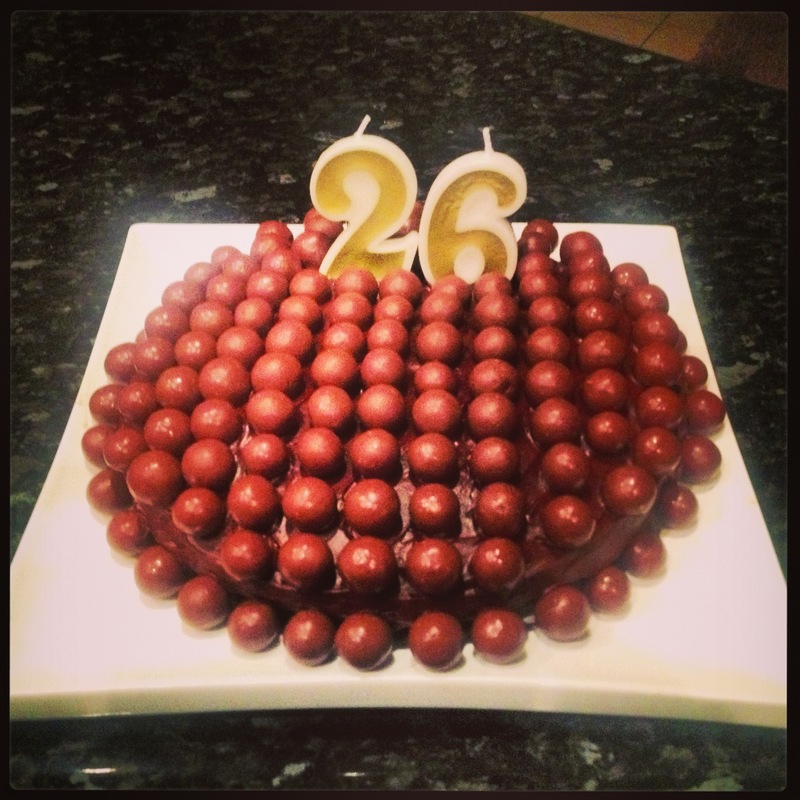 Yes he was very pleased, ate every last Malteser from the top of the cake! Thank you Sophie – it was sooo delicious! Oh wow!! What a beautiful cake! 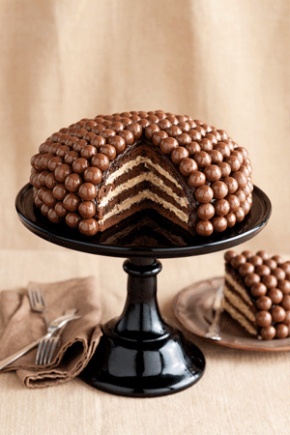 My daughter and I love Maltesers and I have got to make this cake! Thank you – it is sooo delicious! You will have to let me know if you make it! What a cool looking cake – so cute!!! Thank you Celesta – it was also scrumptious!